Marc Leishman cruised to victory in South Africa by six shots, thanks to a closing 67, to claim his first European Tour title. Leishman lost a play-off for the Open at St Andrews but it has been a mixed year having pulled out of the Masters when his wife fell seriously ill with toxic shock syndrome, a rare but life-threatening bacterial infection which meant she was put into an induced coma. He began the day with a one-shot lead and kept well clear of Henrik Stenson thanks to birdies at 10, 13, 15 and 16. England's Chris Wood, who was laid low by heatstroke at the start of the week, was a distant third with defending champion Danny Willett, Victor Dubuisson, Robert Streb and Branden Grace joint fourth. 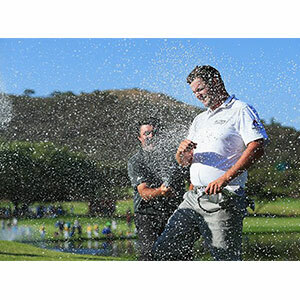 Leishman said: "I'm pretty happy to have this year over, to be honest. Audrey got very sick and I lost an uncle who I was very close to. This tops off what was otherwise not a great year. Three weeks ago we moved into a new house, so this will help pay for that. "Golf's a lot easier when you don't have to make up lost ground, especially on this course where there's trouble everywhere. I was really happy to not have too many bogeys (just three all week). I definitely found out where the trouble was in the practice round!"